On this page, we are featuring custom developed specialty tours from trusted partners. Visit http://www.nichetouring.com for more information. You travel from your departure city to Split! You arrive at Split airport — we’ll be waiting for you! 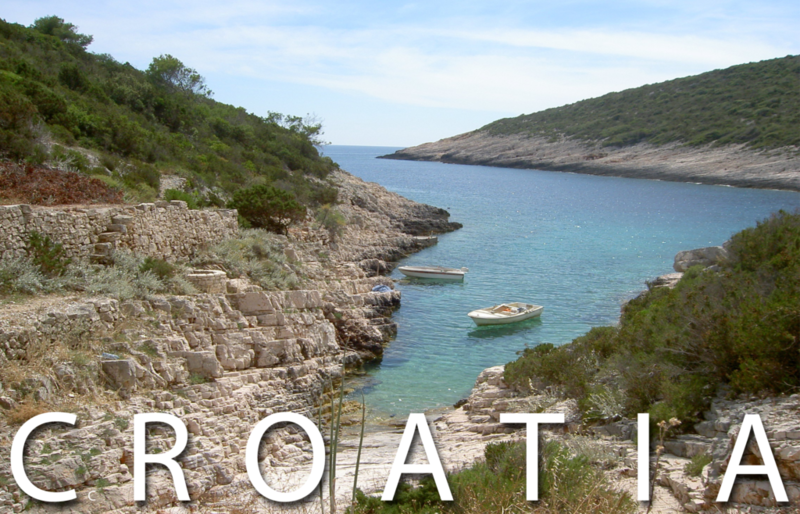 Today we’ll visit the medieval town of Trogir and enjoy a seafood feast right on the Adriatic. Today we’ll start with breakfast on the terrace before heading off to see the lakes and falls of Krka National Park. Be ready for special side trips along the way! Tonight, it’s dinner in the olive grove with a regional expert on Dalmatian smoked meats, including house-made prosciutto. We’ll head south to Split first thing in the morning, stopping at the Roman Ruins of Solona on the way. After we check out Diocletian’s Palace and the other sights of Split, we’ll board a ferry to one of the beautiful, remote islands of Croatia for a peek at life on the Mediterranean as it was five hundred years ago. Get your morning started with breakfast down by the waterfront, and then hop in the boat for an (optional) cave excursion. A quick half hour ride, a tour of the cave and its blue, reflective waters, and you’re back by noon. In the afternoon, we’ll visit the gardens of two brothers, proprietors of a hidden alcove on the Adriatic. They’ll prepare a gourmet dinner for us, using their home grown organic meats, produce, fresh fish and homemade wine from their vineyards. When you’re full, float in the waters at one of the only sandy beaches in Croatia. Following breakfast and a morning of free exploration, we’ll visit a rural village on the mountain top and tour the old homestead of our friends Nikola and Ivana, and stroll through their olive groves and orchards. Enjoy dinner at a rustic “konoba” (small tavern), savoring meat and vegetables in the traditional “Peka” grill style. On our way home, we’ll drop by another neighboring village for a visit to friends Vinko & Ina’s farm, to sample their olive oil and their famous Plavac & Vulgalva wines. Back to the waterfront just in time for sunset. Breakfast by the waterfront is first, then a tour of a local monastery. We’ll visit the historical fishing museum downtown, with time for strolling in the waterfront shops. Later, we’ll hike up Tito’s cave, stop for lunch under the Mulberry tree, and finish up the evening with a terrace party hosted by local family friends. Board the ferry for Split in the morning, and enjoy breakfast on the boat. A private bus will transfer us to our overnight stop in Mostar, Bosnia. Experience the sights and history, enjoy beautiful meals, and shop in the bazaar. We’ll finish our journey down the Adriatic coast, stopping for some of Croatia’s best oysters on our way to Dubrovnik. In the early afternoon, we’ll arrive in the small, medieval town where we will stay. Check in to the hotel and enjoy dinner together on the waterfront. We’ll start with breakfast at the hotel, then travel by boat to Dubrovnik Old City. A private guided tour will show you around the old city, and you’ll walk on the famous walls surrounding the city. Enjoy the afternoon to yourself to explore! Join us for breakfast, and then it’s a free day! Tag along on an optional excursion to Montenegro, if you’d like, or take the day for swimming, walking the peninsula, shopping, and relaxing. This morning we’ll start with a tour of the Konavle region: See the southernmost area bordering Bosnia and Montenegro, with fresh water trout streams, and low forests of pines and cypresses. We’ll do some wine tasting at the home of a well-known winemaker in the Dubrovnik area, visit some old, beautifully restored watermills. Pause for lunch on a deck in the middle of a trout stream before heading back for our last evening together on the waterfront. Say goodbye, friends! Depart from Dubrovnik and head back to the USA. Contact info@nichetouring.com or 215-816-5754 for more details, or visit http://www.nichetouring.com/details to register.